NEVADA CITY, Calif. August 30, 2017 – Sierra Streams Institute is taking their much-loved California Naturalist class to the next level! 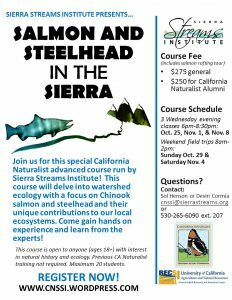 This fall, Sierra Streams will be offering the California Naturalist advanced training course: Salmon and Steelhead in the Sierra*. The course will run for three weeks this fall. View the course flyer HERE and to register go HERE. Participants in the course will gain valuable insight into the lives of these fascinating and charismatic organisms that travel hundreds of miles to complete their life cycle. With the ability to live in both the salt water of the ocean and the fresh water of the river, known as anadromy, these keystone species have become an icon of the west and a barometer for the health of our waterways. 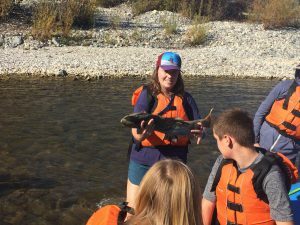 The course will take you on a journey from the spawning tributaries of Nevada County to the efforts to conserve local runs on the Yuba River to the regional scale efforts to protect these species from extinction. The course will be three evenings of fascinating presentations from experts working locally on conservation efforts to visionaries attempting to protect these species on a global scale. Two weekend field trips will cap off this extraordinary opportunity to learn from the experts while observing the local Chinook spawning run in person. Field trips include SYRCL’s Salmon Tour experience where participants will raft down the lower Yuba River, with raft guides from Environmental Traveling Companions (ETC), to experience all of the salmon spawning action firsthand. 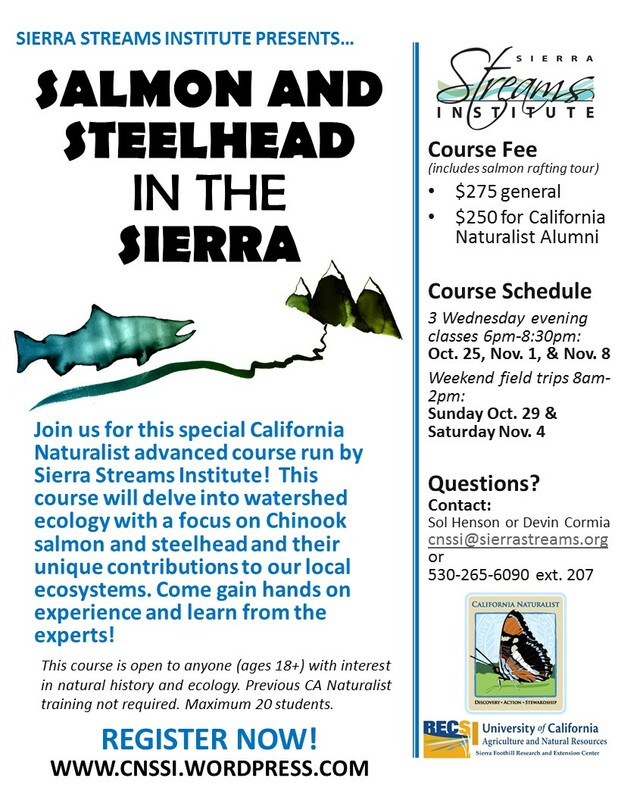 In addition, Sierra Foothill Research Station will provide an opportunity for a walking tour of an actual salmon and steelhead spawning restoration site with local experts that take you through the on-the-ground efforts being put forth to conserve our last remaining anadramous fish. We hope you will join us for this one time advanced training experience with the support of California Naturalist, the pre-eminent natural history program for adults across the golden state. The program was developed by the University of California Division of Agriculture and Natural Resources to foster a committed group of volunteer naturalists and citizen scientists trained and ready to take an active role in natural resource stewardship. Dates for the class are Wednesday evenings, October 25th and November 1st & 4th, and field experiences are on Sunday, October 29th and Saturday, November 4th. Payment for the course is $250 for California Naturalist Alumni and $275 for the general public. This fee includes the $55 fee for the SYRCL led salmon tour. To register for the course go HERE. For more information about Sierra Streams California Naturalist courses go to our website www.cnssi.wordpress.com. The course is capped at 20 students and it will fill up quickly, so sign up soon! *Please note that this is not the certificated California Naturalist class that is offered in the spring that runs for 10 weeks. This course is open to anyone (ages 18+) with interest in naturalist history and ecology – previous California Naturalist is not required.